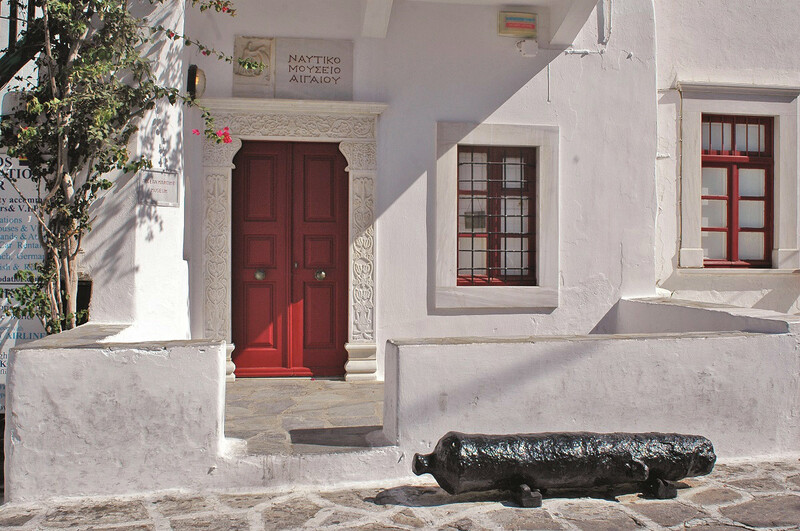 The Aegean Maritime Museum is housed in a traditional Mykonian building of the 19th century located at the centre of the Town of Mykonos, in the area known as Tria Pigadia. The building was the home of the legendary Master of the merchant ship “Enosis”, Nikolaos Sourmelis, who assisted the Cretans during their war of independence from the Ottoman Empire. The Aegean Maritime Museum is a non-profit institution. It was founded in 1983 and in 1985 it opened its doors to the public, on the island of Mykonos. The goal of the museum is the preservation, promotion and study of the Greek maritime history and tradition, and in particular the evolution and activities of the merchant ship, chiefly in the historic region of the Aegean Sea. The founder and chairman of the Museum’s board of Trustees, the Myconian George M. Drakopoulos has been honoured for the foundation of the Museum with the Athens Academy Award and with the World Ship Trust’s Award for Individual Achievement. In the museum’s garden lie reproductions of ancient marble gravestones from the islands of Myconos and Delos, dealing with shipwrecks and sailors who were lost at sea. The Aegean Maritime Museum was the first museum in Greece that rescued and restored living historical exhibits to operate as they were originally designed and built: The “Armenistis” lighthouse (built in 1890), the “perama” type sailing ship “Evangelistria” (built in 1940) and the cable-laying ship “Thalis o Milesios” (built in 1909). The “Armenistis” lighthouse operates again in the Museum’s garden, in Mykonos, while “Evangelistria” and “Thalis o Milesios” are berthed at the Hellenic Navy’s Museum wharf at the Paleo Phaliro marina. The Aegean Maritime Museum participates in international conferences and exhibitions, as well as in the festivities of the Hellenic Navy for the “Maritime Week”. It has also developed a significant publishing activity in the area of the Greek maritime history.